UPDATE: The release date for this was marked incorrectly on NetGalley and Goodreads, so I ended up publishing this WAY earlier than I would otherwise have. I’ve now updated the date here and on Goodreads based on the information on Amazon.com and the publisher’s website. Aside from Isaac Asimov novels and the first volume of the Science Fiction Hall of Fame, I haven’t really read much classic science fiction. I feel there is something worthwhile in expanding horizons, also into the historical context of the past, so I was pleased to have a chance to check out the start to this collection of the complete short fiction by Golden Age author Clifford D. Simak. As you might expect for something written over half-a-century ago some of Simak’s stories are a bit dated in terms of both the science and culturally. But they aren’t particularly offensive to modern sensibilities and there is still a lot to be enjoyed within these stories. It should appeal to anyone wanting more exposure to classic tales of the genre from an author whose stories age relatively well and people who want to revisit beloved Simak tales. This first volume of a planned fourteen in the collection doesn’t seem to have any particular scheme to its organization, but the tales do span a range of the types of stories and themes that I gather Hugo and Nebula Award-winning Simak is best known for. Each story is preceded by a short introduction from editor and executor of Simak’s writing estate, David W. Dixon. 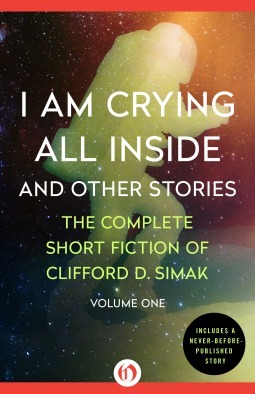 I Am Crying Inside and Other Stories begins with a longer story that features Simak’s repeated exploration of robotic intelligence and emotion. Robots are obviously a frequently visited topic in SF, not new even in Simak’s time. Despite the familiarity of the types of questions/dilemmas regarding robots that Simak delves into, his take still doesn’t come off as cliched now, or dull. While I find the opening story “Installment Plan” to be overly long, it did resonate with how human the robots were it in, not mere automatons, but created instruments that had emotions and personalities. Simak’s robots seem more alive and human than many of his human protagonists. The concluding story “All the Traps of Earth” returns to the robot themes in a far more powerful story where a robot who has escaped mandatory memory erasure finds a home and purpose elsewhere beyond, but not completely divorced from, humanity. “Small Deer” and “Gleaners” are two representatives of Simak time-travel stories. The latter is about a group that goes back in time to retrieve objects of value and felt like an early version of a story that I’ve seen crop up often in recent years still. Simak’s seems less about the cleverness of the time-travel setup as about the intrigue of the story and characters. “Small Deer” on the other hand is more about the idea than the particular adventure of the plot. In it a man goes back in time to witness the extinction of the dinosaurs and discovers what killed them may be back again for humankind. I enjoyed the story for its “Twilight Zone” type vibe, and it is an example of a Simak tale that includes some elements of horror. Simak, who won a Stoker achievement award in its first year of being offered, does employ light horror in some of his stories, most evident here with “Madness from Mars” and “The Call from Beyond”. The latter can be accurately described as Simak trying some Lovecraft flavors. Both stories feature humanity discovering something unsettling and strange as a result of space exploration. These weren’t my favorite stories here, and the science in “Madness from Mars” is particularly dated, but they are fairly good. The titular “I Am Crying All Inside” and “Gunsmoke Interlude” were the stories I least enjoyed. The latter is straight up pulp Western, a genre I simply could care less about. “I Am Crying All Inside” is one of the most emotionally resonant stories here, the most touching. While Simak made his robots larger-than-life, it seems he usually made his humans more salt-of-the-Earth. Wixon quotes Simak in the intro to this story as responding to criticism of his human protagonists as ‘losers’ with the explanation: “I like losers”. The folksy nature and regional dialect of the voice in the story ruined it for me. On the opposite end of the spectrum, “I Had No Head and My Eyes Were Floating Away Up In the Air” and “Ogre” were my favorite stories of the bunch. I largely liked both of these stories because of the biological elements they contained and their shared theme of anti-exploitation. The former story though is weakened by going on far too long for what it is, and with a fair amount of repetition. In it a man arrives on another planet intent on stripping it of its resources for his own economic benefit, with nothing but contempt and disregard for the planet’s ‘simple’, ‘uncultured’ inhabitants. But after an ‘accident’ leaving him dead, the planet’s lifeforms resurrect him in a body more suitable for the environment and he learns the hard way that his preconceptions are way off, and his greed abhorred. Actually, the guy never really ‘learns’ the errors of his way as much as the reader is given a cautionary tale. I loved the biological alien detail here linked to the planet’s properties, and for a time at least I read with an interpretation that the planet itself was a sentient life guiding these events. “Ogre” is another fairly long story, but this time rightly so. It features wonderful biological speculation of sentient plant life and plant life adopted to give photosynthetic capabilities to humans through symbiosis. Interesting stuff, and coupled with it we get a plot again warning against the dangers of exploiting another culture and resources. In this story, members of exploration group try to prevent another human from harvesting sentient trees (that are also musical) and taking them back to Earth. Another notable aspect to the story is that it features a set of space exploration rules very much akin to what years later would form the ‘Prime Directive’ of Star Trek‘s Federation. Overall I’m looking forward to seeing the other volumes collecting Simak’s fiction, and this reaffirms to me the use of at least trying out some classic Golden Age SFF. It is impossible now to read everything that has gone before to form the genre field and still keep up with the exciting directions it is going today to evolve from that past. But dipping into the historical perspective is valuable not just in showing what has been done well, but also what mistakes to not make or move on from. And it is reassuring – though simultaneously slightly depressing – to see social themes still explored today already brought up so many decades ago in that Golden Age of SF.